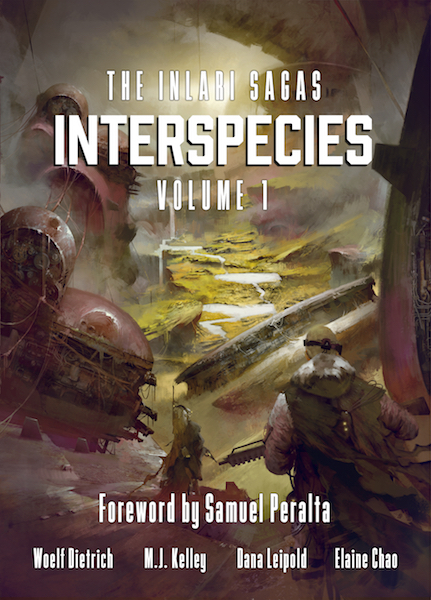 Interspecies, Volume 1, The Inlari Sagas Available Now! “These are generally hard-hitting stories about a grim future world. . . . I found the exploration mind-stretching . . ." ~Piers Anthony, New York Times Bestselling Author of the Xanth Series “Interspecies is a solid science fiction anthology that provides entertaining reading for a thinking person and sets a high bar. . . . … Continue reading Interspecies, Volume 1, The Inlari Sagas Available Now! The above image is a small strip I cut from our cover for Interspecies. It's a teaser of what's to come. Remember last year when I did a blog post on Kōsa Press titled, The Magnificently Dark Piofoks, in which I showcased our cover artist's talent? Well, this is part of that beautiful and awesome cover he made … Continue reading Babylon’s Song is Done! These Broken Worlds is Out Now! Today is the official release of These Broken Worlds and I wrote a special post celebrating the occasion over at Kōsa Press's blog. It is our first publication, making today a significant event in our label’s short history. It also introduces the drilodyte universe and I'm dying to share this with you. So please come join us. Besides, … Continue reading These Broken Worlds is Out Now!